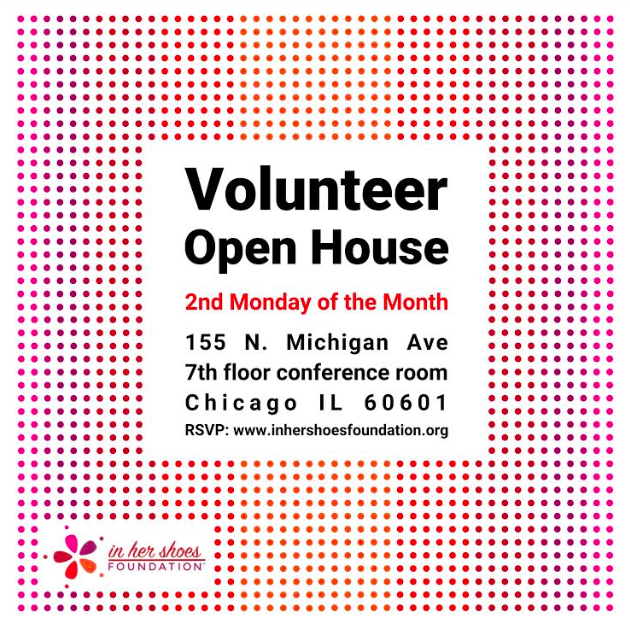 In Her Shoes Foundation hosts a Volunteer Open House to showcase our various volunteer opportunities. If you attend this monthly opportunity, you’ll quickly get familiar with our programs by learning about the volunteer roles from current volunteers. All interested individuals are welcome to attend, however, please note the Volunteer Open House is not mandatory to attend before getting started as a volunteer but it is highly recommended. RSVP’s are required. Meetings are held every 2nd Monday of the Month from 7-8pm at our 155 N Michigan Ave office location on the 7th floor conference room. Come meet new and old volunteers and learn about our In Her Shoes Foundation. Space is Limited. Due to the high demand of interest, a $5 fee is required to via Eventbrite link found on our website to secure your registration. Unfortunately, there are No refunds.